"Journey to the Center of the Earth," by Jules Verne, is part of the ""Barnes & Noble Classics" "series, which offers quality editions at affordable prices to the student and the general reader, including new scholarship, thoughtful design, and pages of carefully crafted extras. Here are some of the remarkable features of "Barnes & Noble Classics" All editions are beautifully designed and are printed to superior specifications; some include illustrations of historical interest. "Barnes & Noble Classics "pulls together a constellation of influences--biographical, historical, and literary--to enrich each reader's understanding of these enduring works. Wildly popular, prolific and prophetic, Jules Verne leads his legions of delighted readers on journeys beneath the sea and beyond the stars. Here, the grandfather of modern science fiction takes us to the Earth's core. The quest begins when irascible but dedicated mineralogy professor Otto Lidenbrock finds a centuries-old parchment inside an even older book. His nephew Axel decodes it, and discovers instructions on how to get to the center of the Earth: "Go down into the crater of Snaefells Yocul," an extinct Icelandic volcano. As they descend, the explorers also travel backward to the past, through layers of human history and geologic time, encountering prehistoric plants and animals and ultimately coming to understand the origins of humanity itself.Though brimming with exciting exploits, this journey is also metaphorical--a spiritual and psychological trip to the center of the human soul. 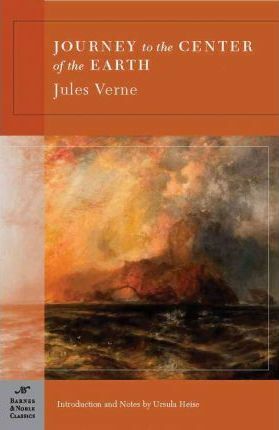 While many of Verne's scientific speculations have been proven, it is this author's remarkable ability to fashion a rousing tale full of compelling characters, extraordinary adventures, and provocative ideas that ensures he will be read for years to come. New original illustrations by Rachel Perkins. Ursula K. Heise is Professor of English and Comparative Literature at Stanford University. She has published a book, "Chronoschisms: Time, Narrative, and Postmodernism" (1997), and numerous articles on contemporary American and European literature in its relation to science, ecology and new media.